Let's be honest, whether you're a makeup pro or novice applying liquid eyeliner can be tricky, if not a total nightmare. But if you don't have the steady hands of a heart surgeon don't worry, I have a sticky trick which is by far the best way to master winged eyeliner; scotch tape. 1. Apply an inch-long piece of Scotch Tape under your bottom lash line at the corner of your eye, at an angle towards your temple. How you apply your tape will determine the shape of your feline flick/cat eye. 2. Next take your eyeliner and apply it as close to the root of your upper lash line as possible and into the inner corner of your eye. I personally find resting my little finger on my face helps to steady my hand. 3 & 4. Using the Scotch Tape as a guide, continue applying liner along the tape (mess isn't an issue!). Then bring the eyeliner back towards your lash line in a triangle shape and fill it in. Remember liquid liner starts thin towards the inner tear duct and gradually widens and comes to a sharp point at the end of the flick. 5. 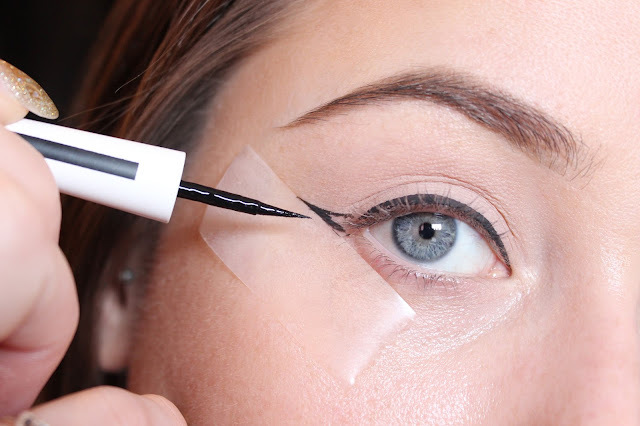 Now gently remove the tape (but make sure the eyeliner is dry first) to reveal a smooth and straight feline flick. 6. Go over the eyeliner if required and clean up your under eye area with a cotton bud and a little makeup remover. 7. Next tightline your upper water line (without jabbing yourself in the eye). This will define your lash line and fill in the visible space. 8. Polish the look by applying a few coats of mascara. But remember it's all about the liner not the lashes! 9. And voilà! You've mastered the sticky trick for perfect winged eyeliner! Have you ever tried this sticky trick?